This mild soap cleanses your skin gently and improves its texture, awakening the skin’s own ability to become beautiful for a gorgeous finish. 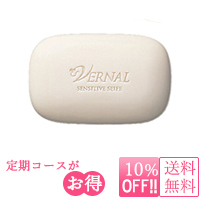 <Quasi-drug>This mild soap gently removes the burden on your skin and improves its texture. In addition to containing cleansing ingredients that can even be used on delicate skin, it is formulated with 16 types of ingredients with exceptional moisturizing effects including shea butter, honey and hyaluronic acid. While cleansing your skin gently, it improves its texture so that it can maintain moisture on its own. *A foaming net for the soap will be given as a gift to customers who purchase two or more 110 g soap in a single purchase. *Vernal’s products do not contain with hydrolyzed wheat protein.